Happy Holidays: Happy (Canadian) Thanksgiving Everyone! I have not made a post on my blog for a while, my apologies. Getting ready for winter has taken up a bit of my time. We had to clean up and bag branches ready to haul off to be recycled. There was two days of stacking wood. We had to call in the septic guy to pump out the septic tank. That meant digging up and clearing the opening to the tank and the grease trap. It is times like this that make you wish for the not so environmentally friendly sewer system. The sewer system in Victoria is pumped out to sea after being ground up and strained for solids! The powers that be see nothing wrong with this. Enough of my rant. In amongst all of this I have been in the studio working. Our son, Mike said to decorate. He said that Phoenix would not be a problem. I started to set up a display in the hall and am just finishing it. I will post a picture in a few days. 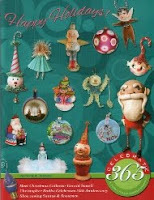 I love decorating for the holidays. 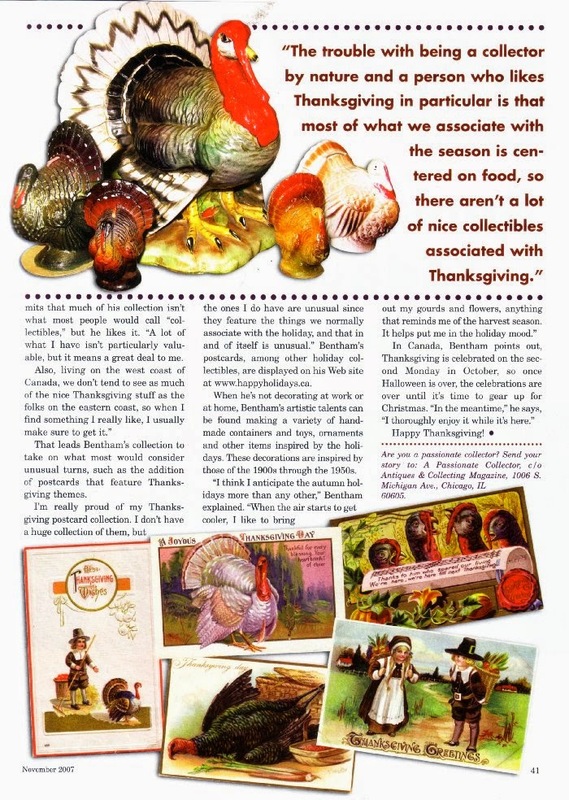 Unfortunately I did not put out any of my Thanksgiving items this year. 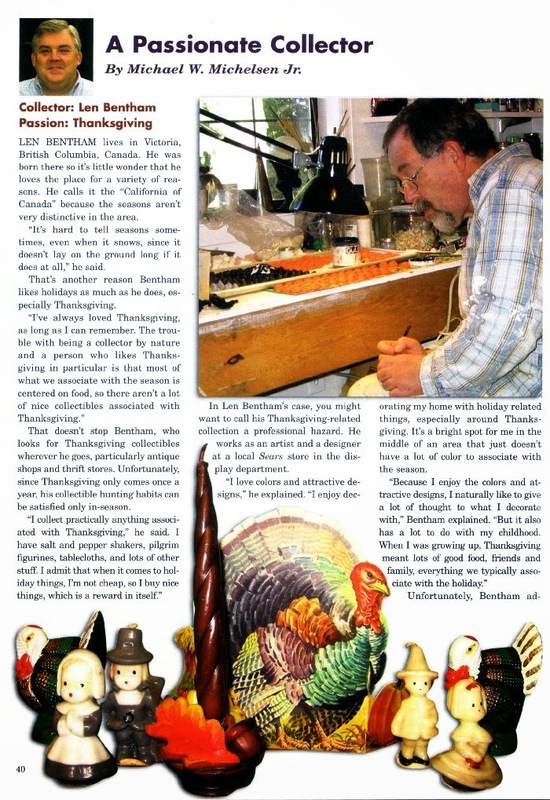 Here is an article about some of my Thanksgiving collection that appeared in "Antiques and Collecting Magazine", November 2007. Click on each image to see a larger more readable version. Congrats Len, next time the article will be about your fantastic Halloween art. Thanks, Jorge. I hope you are resting for your next show. An update about my updates. Joy Studio is having a give-away!